It’s an unquestionable fact that there’s no lack of perks in a government service. Aside from a decent base salary employees and pensioners of Central government also enjoy a wide range of allowances, which is a major reason that keeps attracting talent to various government departments year after year. 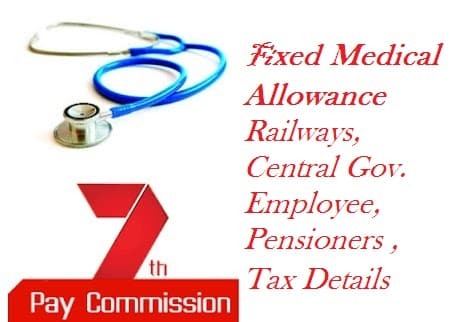 Fixed Medical Allowance is also one of those allowances. It’s a component of Central Government Health Scheme (CGHS), a scheme that was launched by the government to support the medical needs of its employees. As expected, it often feels like a great perk to employees. However, it also creates a lot of confusion among new employees when they file their income tax returns. In this article we’ll try to clear those clouds of confusion. Let’s get started. Before we can understand whether FMA is taxable or not we need to understand the difference between these two terms. In CGHS vocabulary two different terms have been defined for the type of compensation that’s paid to employees for financing their medical expenses. One is Fixed Medical Allowance, or FMA, which is paid on a monthly basis. It’s called “Fixed” because it’s paid for every month whether an employee claims it by submitting any bills or not. Another type of payment is Medical Reimbursement. When an employee claims his medical allowance by submitting cash memos, bills and other documentary proof of receiving treatment, the allowance paid to him is called Medical Reimbursement. It’s called reimbursement because it’s paid after an employee had already paid for the treatment. The confusion arises when people use these different terms interchangeably. As there’s difference between their definitions, there’s difference between their taxation rules as well. Fixed Medical Allowance: Taxable or Not? Now that you know what Medical allowance and Medical Reimbursement are, you’re in a good position to understand whether this allowance is taxable or not. Medical Reimbursement (that is, the allowance paid to you upon submission of bills) received up to Rs. 15,000 in an year won’t have any effect on your wallet. It’ll remain tax free as long as you submit adequate bills to prove that you or any of your family members has received treatment. However, if you fail to submit the bills on time, it’ll be taxed at the rate of 30%. And so on. Since reimbursement is the only way to save a medical allowance from being taxed, you should claim it whenever possible. I hope this information cleared the doubts that you might’ve had regarding FMA. Now use it to save taxes. All the best!